In a first for space flight, SpaceX will attempt to fly its Falcon 9 booster rocket to a safe landing aboard an offshore platform. 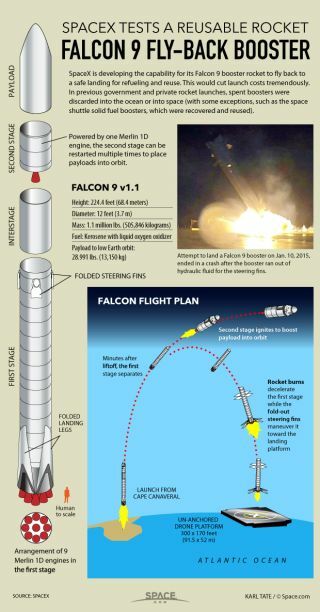 The private spaceflight company SpaceX will attempt a never-before-attempted reusable rocket landing on an ocean platform with the launch of its Falcon 9 rocket and Dragon spacecraft from Cape Canaveral Air Force Station in Florida on Jan. 6, 2015. Here's how the planned mission will work. In a space first, the Falcon 9 rocket first stage used to help launch the Dragon cargo capsule toward the International Space Station will attempt to fly back down and land safely on an offshore floating platform in the Atlantic Ocean. SpaceX had the platform specially built especially for the rocket landing attempt. After the first stage separates, three separate engine burns put the spent stage on course to re-enter the atmosphere and slow down from 2,900 mph (4,600 km/h) to 4.5 mph (7.2 km/h) at the time of touchdown on an offshore floating platform. The test, which follows two earlier rocket "landings" on the surface of the Atlantic Ocean by SpaceX, is part of the company's program to develop completely reusable rocket technology to lower the cost of spaceflight. Meanwhile, SpaceX's Dragon spacecraft should continue its mission to deliver 5,200 lbs. (2,360 kilograms) of supplies and gear for 256 scientific experiments on the International Space Station. The mission, called Commercial Resupply Service 5, or CRS-5, will be SpaceX's fifth cargo delivery flight to the station for NASA. SpaceX has a $1.6 billion contract with NASA for 12 such flights using its Dragon spacecraft and Falcon 9 rockets.